This week, we are preparing for Freedom Friday (Canada Day + USA’s 4th of July), where both countries celebrate who we are and the liberties our freedom gives us. As a Canadian working for an American company, Freedom Day has a great deal of meaning for me. I truly wish all countries of the world could enjoy the freedom to express themselves, enjoy life, and work together just like Canada and the USA. But I think Freedom Day should include Mexico, too (let's hear it for North America united!) So, from this point on, I plan to have the art team incorporate some 'Mexican Independence Day' themed items for Freedom Day. HeroSmash is a fictional world in which we are all a part of its creation. My vision for HeroSmash is to be an example of a better world where everyone is a Hero (or Villain?!) with goals larger than the world itself. 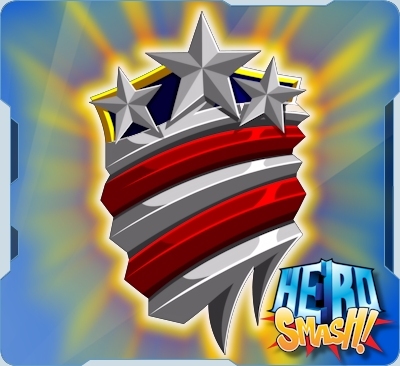 Freedom itself is a major theme for HeroSmash. Artix Entertainment has promised to keep HeroSmash running for as long as possible. But, this is a difficult task for many reasons. Due to the majority of games going mobile, AE has been forced to adapt in order to survive, resulting in many changes. Such changes caused AQ3D to be pushed aside for mobile projects like Battle Gems. When time allows, I hope that project comes back to life! HeroSmash admittedly had a bad start. Combine that with all the team members being moved to the 3D project (then later onto mobile and other projects), it has not boded well for HS. It was decide that I would run HeroSmash. I am proud (and happy!) to be working on HeroSmash, but it is not my only duty at AE. Game promotion is an aspect I'm deeply involved in (wallpapers, web art, and ads), and much of HS still needs fixing before implementing a major storyline push. Much of HS I have done on my own. The Art Team is made up of talented volunteers wishing to get hands-on experience in the gaming development sector. The team has changed many times since our inception, but I'm still fighting to make HS better. Lately, the current team has been adapting to life (work, school, and health). But there is good news! All are ready to step up and have already started on new ideas for artwork. I want everyone to know HeroSmash is NOT dead . . . it's like an undead zombie clawing its way up from under the ground. One day, we will rise to stand in the moonlight, at which point you'll probably be punching us for trying to eat your brains (but we promise not to hold any grudges over that). Unfortunately, it will take time. And patience. The only thing that can change is you—our fellow players. Nothing drives progress as much as demand, and to give us the resources we need to speed things up, we need YOUR support. Show us you want to play HeroSmash. Show us that you want it to grow. No matter what life throws at you, be a real hero and help the world around you. Heroism isn't just what people see… it's the little things that you do even if you're the only one who will ever know. Not for vanity or profit, but because that what makes true heroes into super heroes.